Alia Bhatt said: "My super woman/trainer Yasmin Karachiwala will make sure I don't skip my workouts"
Alia Bhatt thanked her trainer for making workouts "innovative"
Bollywood celebrities are dedicated when it comes to fitness. Many actors are spotted coming in and out of gym beating bad weather or even lazy weekends. 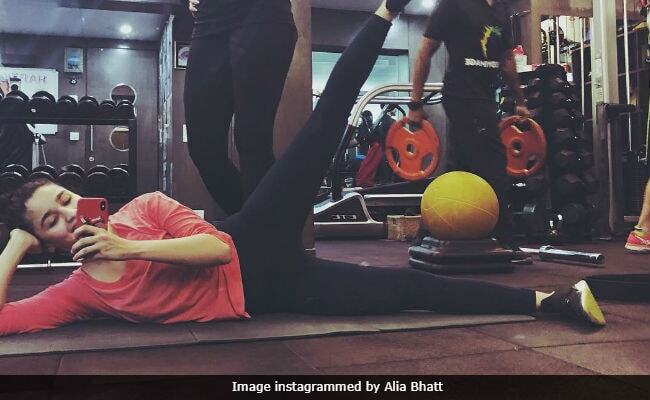 But Alia Bhatt took this dedication to a whole new level - she was working out despite shoulder injury with Yasmin Karachiwala (celeb fitness trainer). She instagrammed a mid-workout picture and captioned it: "Standing up or lying down... My super woman/trainer Yasmin Karachiwala will make sure I don't skip my workouts even with an injured shoulder... I love when you go all innovative on me Yas!!!" Yasmin Karachiwala specialises in Pilates and Alia Bhatt swears by it. The Student Of The Year actress often posts workout updates with captions that will compel you to cross out some reasons from the list of "Why I'm Not In The Gym Today." Here's a Monday Motivation technique - workout with your colleague. Alia Bhatt and Ranveer Singh are co-starring in Gully Boy, which is directed by Zoya Akhtar.